From the overlapping, I move ahead to learn how the test, technique and design is part of each other, I see, the three more now by adding to conversation. It is -- Coverage, Action, Information (Potential Problem), and Assessment. This looks to be me as in the below image. I understand this for Test Model -- a representation by which I'm learning the product either associatively or relatively or by both means. Further, I can still refine the model to specific learning i.e. to assist in obtaining the specific type of information from my testing. Moving ahead, I will learn what information is expected from my testing. Knowing this, I will have to build a Test Model or use a existing one, to understand the product and my tests which I will be executing. The Test Model will help me to learn critical factors associated to product, environment, project and related components. Now, I will have to choose the test techniques or build one. This has to assist me in building and strengthening tests by involving the heuristic within it also by identifying the heuristic from Test Model and tests. This heuristic will help me to understand the outcome of test. 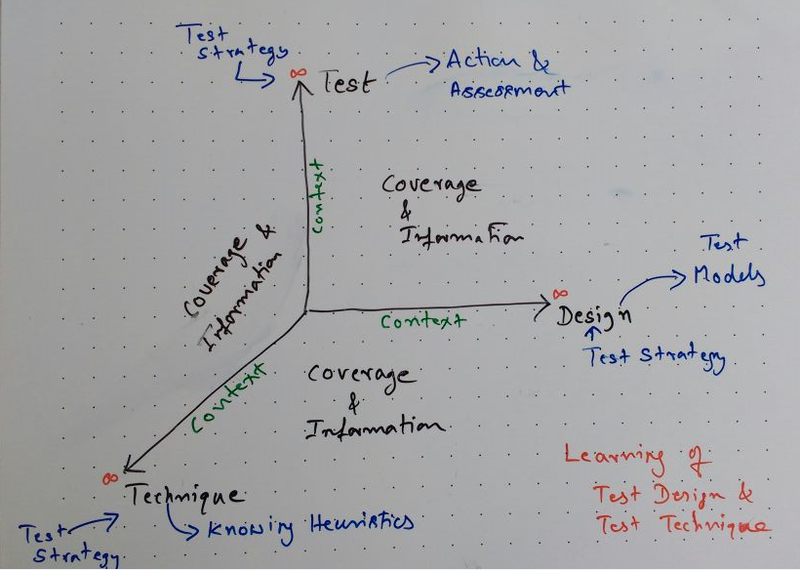 When I have figured out (or as I figuring out) the Test Model, Test Technique, and Heuristic for the test, I will have know what is the Test Coverage to be accomplished in context of testing. This gives the dimensions and influencing description to say why is this my Test Strategy, and why I have made use of this model, technique, and heuristic to arrive at this coverage. As I execute my test and the way in which I record it, this overall constitutes the part of my Test Design. Looking at the techniques, I have known there classification from the Software Testing books as Black Box, White Box and Grey Box. I'm learning there is much more within each of these types than the books say. To summarize my so far learning, I see, the Test Techniques is one of the outcome of Test Strategy. The test strategy directs me to pick or build a Test Model. 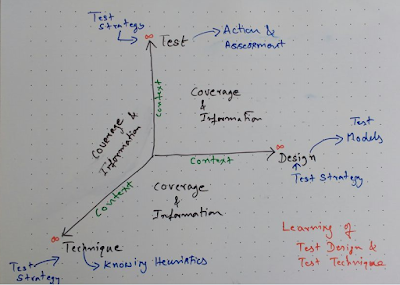 With the help of Test Model(s), I will execute the test by learning how I have to execute it and to what extent using the technique(s) (which is also a heuristic).